Abuja, Nigeria 14 December 2012 - Greetings from the NOI Polls team! 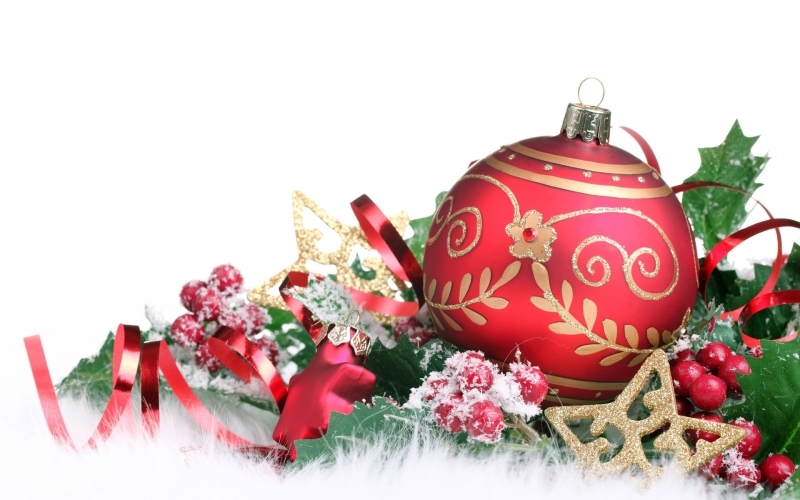 Best wishes for a great holiday season and a wonderful new year ahead. We are delighted at the great progress made this year by the polling centre and look forward to further closing the information gap between decision makers and the public. For the end of year special edition, the team thought to put forward the most interesting results obtained from the nationwide snap polling exercise done during the year. We have polled every month this year but looking forward to doubling this next year. We are most grateful to our partners who have supported this activity throughout the year giving voice to the many Nigerians who otherwise have not being exposed to opinion polling. To make the detailed results available to interested scholars, businessmen, journalists, policy makers and foreign investors, we have started a Poling Subscription Service that caters to all sectors and is affordable. We hope you will be interested in subscribing to our polls, this way we keep the platform going, and change within our sights. Our website provides all the information you need on how to subscribe to this service. We do hope you would enjoy reading through our selection of polls and as usual we would deeply appreciate any feedback from you. Thank you for all your support in this year and we look forward to greater partnerships with you next year. Over 500 airline passengers interviewed at the Nnamdi Azikiwe International Airport Abuja expressed grave dissatisfaction with the quality of services rendered by local airline operators in Nigeria. This snap poll conducted in February 2012 to appraise current developments in the aviation sector, found that most passengers condemned the airline operators for persistent flight delays, missing luggage, and poor customer service offered by front desk officers of airline operators, amongst others. In particular, several passengers expressed disappointment at the impolite and unfriendly behaviour displayed by some front desk officers. A snap poll conducted April 2012 revealed that most Nigerians are not aware of the call for the convocation of a Sovereign National Conference (SNC). Given the attention gathered by the issue in the media, and particularly in recent times, the poll sought the views of over 1000 Nigerians regarding the level of awareness and support for the issue of SNC. Surprising, it was found that nearly 9 in 10 (88%) respondents were not aware of the call to constitute a sovereign national conference. In addition, of the 12% respondents that were aware of the call, the majority (82%) were in support of the constitution of SNC, while 15% were not in support and 3% were not sure. In furtherance, for those who said they supported the call, the poll sought to understand the reason for their support. The reason most of the respondents (48%) gave for supporting the call for a Sovereign National conference is that it would help foster unity, peace and progress in Nigeria. Results from the poll indicate that if the proponents of SNC adopt more effective strategies to create awareness on the issue and its potential benefits to the nation, it could generate support from more Nigerians, particularly the grassroots. A similar poll done during the nation’s 52nd Independence Day celebrations sought to understand what the term “True Federalism” means to Nigerians. 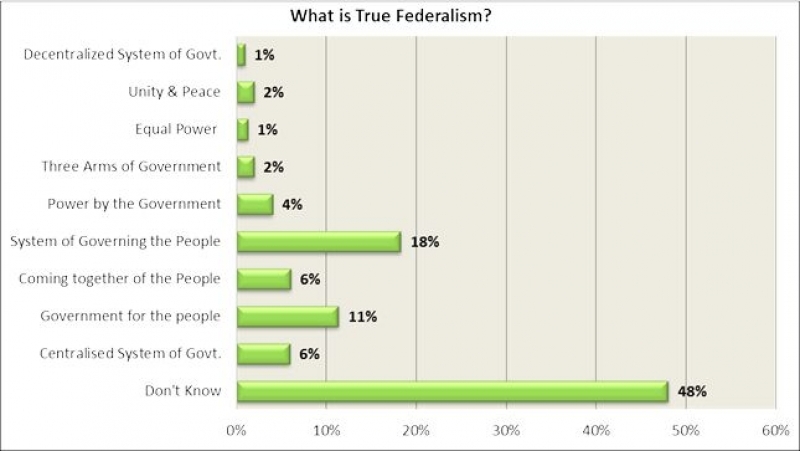 Hence respondents were asked for their understanding of Federalism. Surprisingly, 1 in 2 respondents (48%) said they do not know what the term means despite its frequent usage. What this signifies is, Nigerians are unaware of the political and constitutional platform that determines the power and sovereignty of the state. It has become imperative that all socio political groups should endeavor to educate the Nigerian polity on political and civic matters. This should enlighten the majority of the voting public on expectations tied to performance of their various political leaders. Domestic Abuse in Nigeria: Myth or reality? The month of December saw the continued fight against spousal abuse with a focus on women. NOI Polls carried out a snap poll on the marriage institution in Nigeria in April 2012 on 2,189 phone-owning adults. Given the rising incidents of domestic violence, the survey sought to understand the factors responsible for the recent increase in domestic abuse and violence reported in the media. First, the findings from the survey showed that while at least 1 in 10 respondents (13%) have been a victim of domestic violence in the past; also, 29% of respondents know someone who has been a victim of domestic abuse and violence. Finally, in response to the question of why there is increased domestic violence in the society, 6 in 10 Nigerians (60%) ascribed the recent increase in domestic violence to poverty. The respondents suggested that poverty has led many people into frustration and anger, and at the slightest provocation, people resort to violence as a means of expressing their frustration with their poor situation. Furthermore, 16% and 12% of the respondents were of the opinion that it was because Love no longer exists, and the growing Insensitivity, respectively. 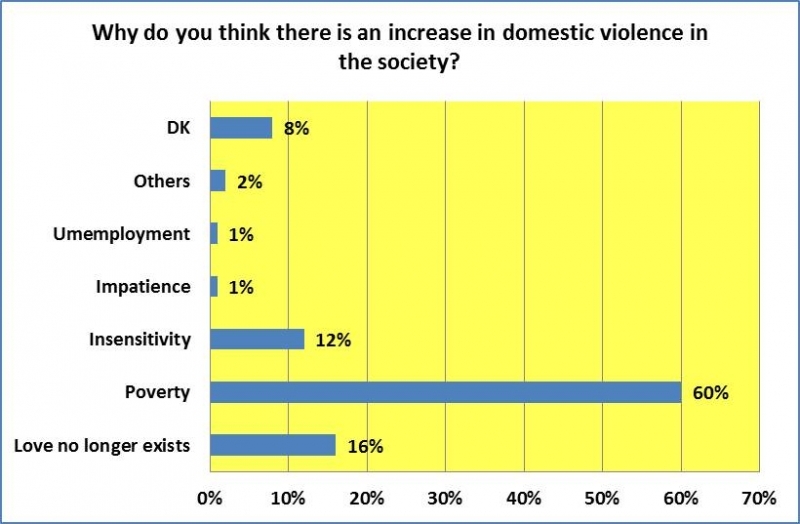 Interestingly, only 1% of the respondents ascribed the increase in domestic violence to Unemployment. In a recent snap poll conducted by NOI Polls during the 52nd Independence month on the performance of the current administration, the majority (46%) rated the current administration’s performance as average, followed by 29% that said the administration has performed badly, and 13% who claimed it has performed very badly. Also, 7% suggested that the current administration has performed well, while only 1% said it has performed very well. However, in comparison to findings of a similar poll conducted by NOI Polls in May 2012; the results show that public perception regarding the performance of the current administration has experienced a decline. In May, even though the majority (37%) rated the administration’s performance average, 31% rated their performance well and 10% very well, in October 2012, the percentage of Nigerians that said they performed well has declined drastically by 24 points, from 31% to 7%; while those that rated the administration very well had also declined by 9 points, from 10% to 1%. On the other hand, the percentage that rates the administration’s performance poorly has risen sharply by 12 points, from 17% to 29%; and the percentage that rates the administration very poorly has also risen by 8 points, from 5% to 13%. With the NPL about to start a new season in August and the EPL already under way, we conducted a nationwide poll on 1,176 phone owning adults to understand the football craze in the country. The results of the survey clearly indicate the football obsession in Nigeria particularly for the English Premier League and not for the Nigeria Premier League. The fact that all respondents (irrespective of gender, age and other demographic indicators) consider themselves football supporters shows just how pervasive this phenomenon is in Nigeria. Manchester United, Chelsea and Arsenal are the top 3 foreign clubs with a large followership in Nigeria. Sentiment and not logic seems to play a large part in choosing teams to support and could explain why most fans stick with their clubs through thick and thin. Nollywood celebrates 20 years in 2013. We conducted a nationwide poll to show firsthand the perception of the Nigerian public towards this industry. Results from the snap poll indicate that Nollywood films are very popular among Nigerians since 98% of the respondents surveyed acknowledged that they watch them. Results also show that comedy (40%) and drama (39%) are the most preferred genres of film in Nigeria followed by romance (14%). The major factor that attracts people to watch certain films is the Actor/Actress involved. This clearly shows that casting the right actor/actress in a Nollywood is a key success factor. Even though the majority (48%) rate Nigerian films as good, the majority also agree that the main area films have to improve on is their storyline. In addition, our poll found that the most favorite Nollywood actors in Nigeria are Nkem Owoh, Emeka Ike and Jim Iyke (all tied at 20%); while the most favourite Nollywood actresses are Genevieve Nnaji (20%), Mercy Johnson (19%) and Omotola Jolade Ekehinde (17%). Also, only 25% of the respondents interviewed watch movies at the cinemas; the main reason why they do not go to the cinemas is because they can buy the DVD and just watch it at home. This is in line with findings from the UNESCO Institute for Statistics that shows that the majority of Nollywood films go directly to DVD and Nigeria only has 0.4 cinema screens to 100,000 people. have to improve on is their storyline.